From VA shortcomings, a suicide every 65 minutes, to lackluster job prospects, we need to do a better job taking care of our vets. - 9% of business in America are owned or run by veterans. - They risked their lives for us. - And we aren't taking care of them. - 1.9 million veterans, and .9 million of their family members lack insurance. - That they can't get the VA to recognize. - 619 days in in L.A.
- And some veterans having to wait for 600-900 or even 1000 days. - Because the VA claims backlog is 600,000 long. 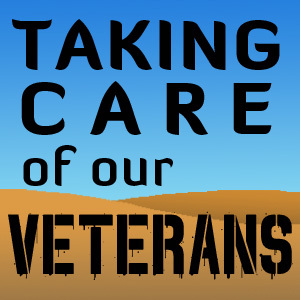 The most common health problems in veterans are severe. - Amputees--More than 1500 recently returned vets are amputees. - 83% have lost one or both legs. Leading to years of reacclimation and therapy. - PTSD and depression--14% of vets said PTSD or depression seriously impaired their daily functioning. - Tinnitus--10% of disability claims are from constant ringing in veterans' ears. - Fibromyalgia--Half of all veterans post-deployment medical visits involve musculoskeletal pain. - Chronic Fatigue syndrome-- Making reintegration to civilian life extremely hard. - Alcoholism--1/8 recent veterans suffer or have recently suffered from alcoholism. - And make it much harder to reaclimate to civilian life. - 1.4 million veterans are at risk of homelessness due to poverty, lack of support, and dismal living conditions. - With 62,619 homeless on any given night. - Making veterans (7% of the population) 13% of those that are homeless. - 207,000 recent veterans cannot find a job. - Many have degrees, real world experience, are physically fit, and have held leadership positions. You shouldn't be penalized for defending your country. - At the end of the day, lack of support, and extreme hardship leave many veterans seeing no other way out. - A veteran commits suicide every 65 minutes. - That's 22 a day. - Or 8030 a year. - Making Vets twice as likely to commit suicide as civilians. - Compared to 1 out of 5780 civilians. Friends, family, and neighbors have been to war. Supporting veterans is the right thing to do. Supporting veterans is supporting us all.